Title: MATHO: or, the Cosmotheoria Puerilis, a Dialogue. In which The first Principles of Philosophy and Astronomy are accommodated to the Capacity of Young Persons .. Translated and enlarged by the author In Two Volumes. 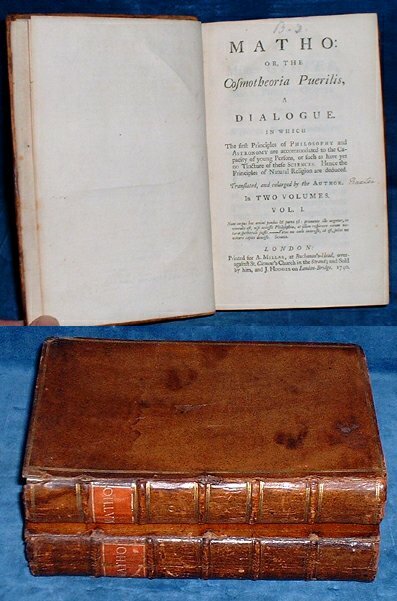 Description: London, A. Miller first edition in English 1740 . Two Volumes octavo calf with 5 raised bands with spine labels in contrasting color to both volumes gilt double rules to covers (tips worn/hinges cracked but covers attached/some scuffing) pp Title & prelims 432pp +pp Titlepage to second volume +contents +395p +p booklist. Second volume with marginal brown stain up to p24 else both volumes crisp and clean and V.G. *A critic of Locke and Berkeley, Baxter was a private tutor, and this book was written for the benefit of his pupils - an interesting glimpse into the teaching methods and curriculum of the 18th century gentleman. It was first printed in Latin in 1738 in a much abreviated form here it has been much enlarged by Baxter.Based on Newton it achieved great popularity.